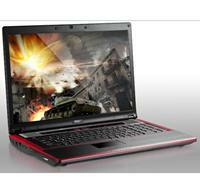 The Taiwanese PC manufacturer, MSI has unveiled its new GT725 notebook. The gaming notebook is featured with ATi Radeon HD4850 with 512MB of VRAM that will enhance the gaming experience. The exterior of the notebook is made from brushed aluminum with stamped sheeting which will help in protection and durability. Featured with 17-inch LCD with options for either 1920 x 1200 pixel or 1680 x 1050 pixel resolutions, MSI GT725 is also powered with a 2.4 GHz Intel Centrino 2 processor. It boasts an HDMI output for connecting to an external device like projector or display, integrated Turbo Drive Engine technology which allow users to over clock the CPU by up to 15 percent with a dedicated button located above the keyboard. In addition, it also equipped with 4GB RAM, a 9-cell battery, a 7200RPM 320GB SATA hard disk and built-in four speakers as well as a subwoofer.